Artocarpus altilis, ‘Ulu in Hawaiian, Its beauty stands out in any garden. Easily 40-60 feet tall, with branches that span a similar-size diagonally. 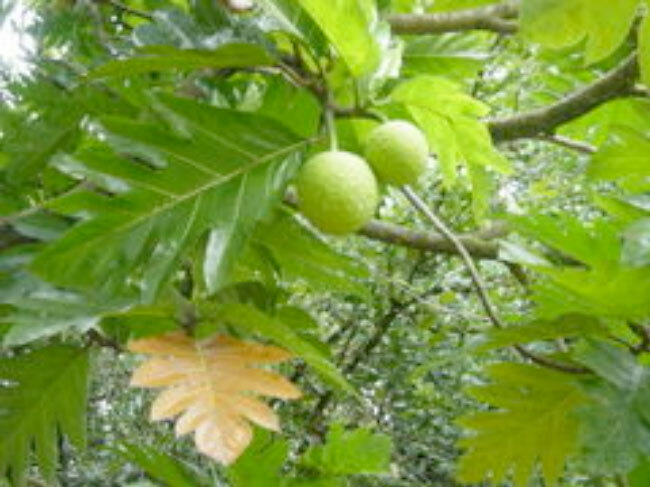 The sensual, dark-green lobed leaves of the breadfruit tree form a tapestry from which lime-green globes grow. The fruit can weigh up to 10 pounds each. The early Polynesians brought this plant with them to Hawaii, different parts of the tree were used: the trunk for poi boards; the bark for tapa; and the fruit for eating. All parts of the tree give off a milky sap (it is sticky), if cut or broken off. This milky sap, used alone or in a mixture with other plants, was used for skin diseases, cuts, scratches, and scaly or cracked skin. Sores around the mouth were also treated with a mixture having this milky sap in it.